Tom Guckian is looking forward to another successful year on the Blue Devil Staff. Tom will focus on snappers, punters and placekickers as part of the special teams program. Tom brings a strong work ethic and history of success to our program as he was a member of a State Championship team in high school and an SEC championship team while attending Auburn University. 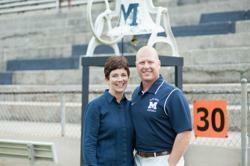 Tom and his wife Tracie have been long time volunteers in the Marietta City School system. Even though their daughters, Kristen (Class of 2011) and Kylie (Class of 2013), both cheerleading captains at Marietta, have graduated, the Guckians plan to be lifetime supporters of the Blue Devils!